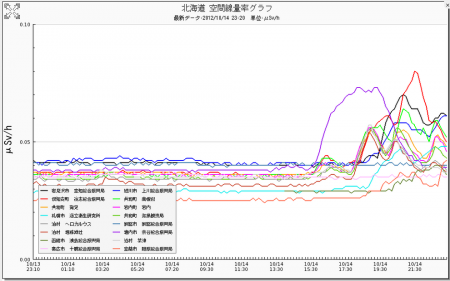 According to the report of Ministry of Education, Culture, Sports, Science and Technology, radiation level spiked up in Hokkaido, the most northern island in Japan. It started picking up at 15:40 of 10/14/2012 (JST), and still it’s on-going. Selon le rapport du ministère de l’Éducation, de la Culture, des Sports, de la Science et des Technologies, Le niveau de radioactivité d’Hokkaido, l’île la plus au Nord du Japon, monte en flèche.